The first showing of this exhibition has been organised in 2007 in Rome, Centrale Montermatini/Musei Capitolini by the “Fondazione Pangea Onlus” (Pangea Non-Profit Foundation) and curated by Manuela Fugenzi. Visitors proceed along a gallery of portraits where they are invited to study Salvinelli's in-depth reportage. The use of portraits for this kind of photojournalism means recording the emotions of lives often marked by profound worries and pain, while at the same time narrating the imperative nature of the impulse for life. The reportraits taken in the Congo by Laura Salvinelli are images that comment on the human presences of a place whose tragic history renders us speechless. 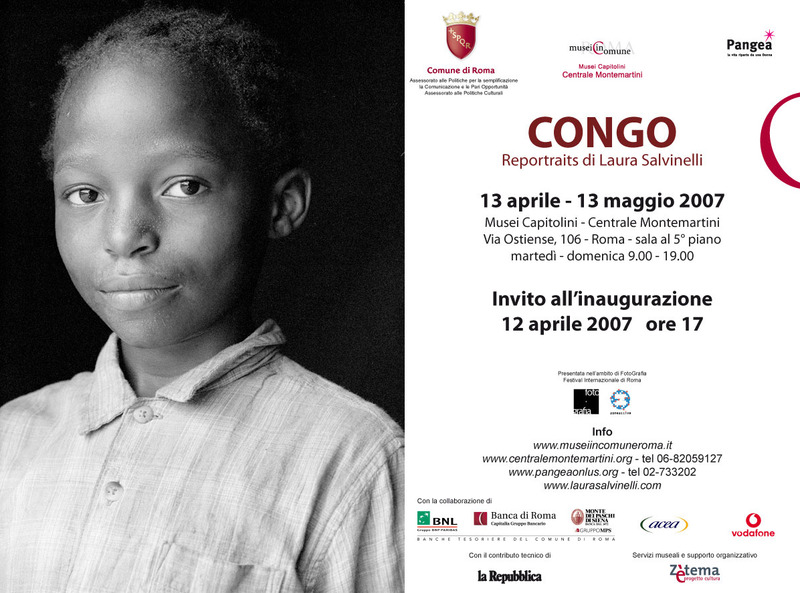 Salvinelli's work contains clear references to the events of the Democratic Republic of Congo, torn by civil war and political corruption: here is a country in constant crisis where still today thousands of refugees are victims of hunger and abuse. In these images the footprints of war appear to remain on the photographic surface; they are observable among the faces and expressions, between the light and shade of the black and white of the eyes, skin and clothes. The high aesthetic value of these portraits is accompanied by a portrayal of inconceivable and intolerably cruel territories, of lives marred by horror: art reveals, meditates and consoles the injured. Laura Salvinelli aims to document a reality she has witnessed, despite the restraints and prohibitions imposed by local authorities, energetically expressing her powerful photographic sensibility. It is a sensibility that cares for, pays attention to, and respects beauty and human dignity. The art of the portrait moves the heartstrings of compassion and dedication to the individual. The tragedies referred to in Salvinelli's work are those of children abandoned and accused of witchcraft, refugee camps teeming with people from the warring areas of Kivu and Ituri, of female AIDS sufferers. The focus is also on the "new beginnings" of young poor women and single mothers in Kimbanseke, a suburb of Kinshasa where they are supported in their journey towards economic and social well being by the Makita project of the Pangea Non-Profit Foundation. For many years now, Pangea has been engaged in promoting development projects for women, including: micro credit and literary programmes, professional courses and training in hygiene and medicine, as well as on human rights and gender issues. In the same spirit of Lewis Hine's committed photography of one century ago depicting child labour and immigrants in America, the portraits in the Centrale Montemartini in Rome, which focus on the latest global emergencies, are accompanied by the personal histories that photography has captured with Salvinelli's extraordinary journalistic sensitivity.